Found 5 file extension associations related to The Secret of Monkey Island: Special Edition and 3 file formats developed specifically for use with The Secret of Monkey Island: Special Edition. The Secret of Monkey Island: Special Edition is an enhanced remake of The Secret of Monkey Island for the PC and Xbox Live Arcade, developed internally by LucasArts and released in 2009. The remake was announced on the first day of the 2009 Electronic Entertainment Expo along with the episodic Tales of Monkey Island. The Special Edition features new character art and hand-painted environments in the style of the original, presented in 1080i widescreen (1920 x 1080 resolution). 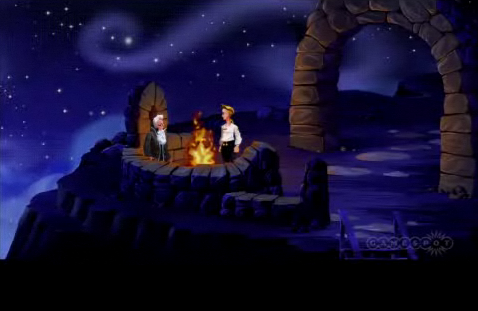 It also features a re-recorded and re-mastered score, and the principal voice artists from The Curse of Monkey Island read the previously unspoken lines, with Dominic Armato as Guybrush, Alexandra Boyd as Elaine, and Earl Boen as LeChuck.The Xbox Live version, to meet specifications, uses compressed audio and artwork, but these assets remain uncompressed in the PC version. The interface itself is streamlined, hiding the verb table and inventory that previously took up the lower part of the screen. These, including the nine-option verb table from the enhanced editions of the game, can be pulled up as a menu, while verbs can also be selected by cycling through pre-set commands. Another new feature is the three-level hint system, which (at the third level) presents a bright yellow arrow showing the player where to go. The dev elopers also added a close-up of Spiffy, the dog in the Scumm Bar, that was deleted from the original versions due to space considerations, despite appearing on the back of the box. It is possible to switch between the 256 color enhanced and the new version of graphics without interrupting the flow of the game.This also switches between the original MIDI soundtrack and the remastered score with ambient sound effects, and the loss of voice-over work for the original version. If you need more information please contact the developers of The Secret of Monkey Island: Special Edition (LucasArts Entertainment Company, LLC), or check out their product website.